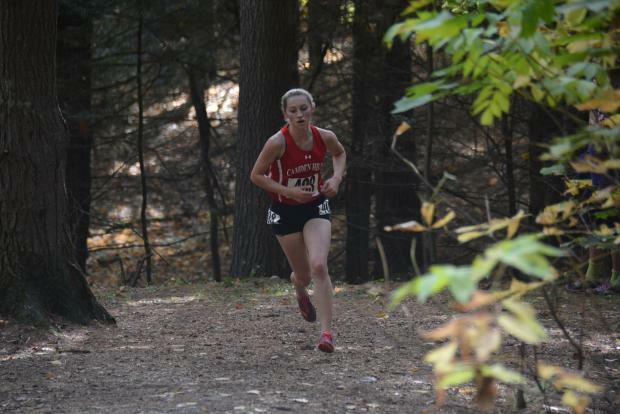 The top seven runners across the finish line In the Girls Class A Championship--the KVAC All Conference First Team--included three from Camden Hills, and three Mt. Ararat Eagles. Only Edward Little's Jillian Richardson broke the skein, finishing 3rd for the second consecutive year, this time behind Champion Grace Iltis of Camden (19:56), and Iltis's teammate Augusta Stockman (20:19). The remainder of the top seven included Karlie Leighton (4th) and Katherine Leckbee (5th) of Mt. Ararat, 6th place Miranda Dunton from Camden, and in 7th Camila Ciembroniewicz of Mt.Ararat. With each team's top three across the line so quickly the team championship was bound to be determined by the 4th and 5th runners for each team. When first year Claire Wyman and senior Alli Wells crossed 15th and 16th, just one spot ahead of Mt. Ararat's Anna Pederson, the team title was secure. Camden Hills took the KVAC team title in the Windjammers first season in Class A.
Camden finished with 40 points to the 55 posted by Mt.Ararat. Defending Champions Brunswick took the third set of ribbons with 129 points. The Dragons were led by Isabella Pols's 11th place finish. Sophomore Itlis's time of 19:56 was very strong for this course. Over the past four seasons Iltis's time has only been beaten once in Class A. Mt. Ararat's Katherine Leckbee took the individual title last season at 19:44, but no other runner in the last four seasons has cracked 20 minutes. Leckbee was plainly favoring one foot after the first mile was in the books. Even so, had she been in better form Camden still had the margin needed to take the team title no matter Leckbee's individual finish. Rounding out the KVAC All Conference team were Brewer's Olivia Mosca (8th), Kahryn Cullenberg of Mt. 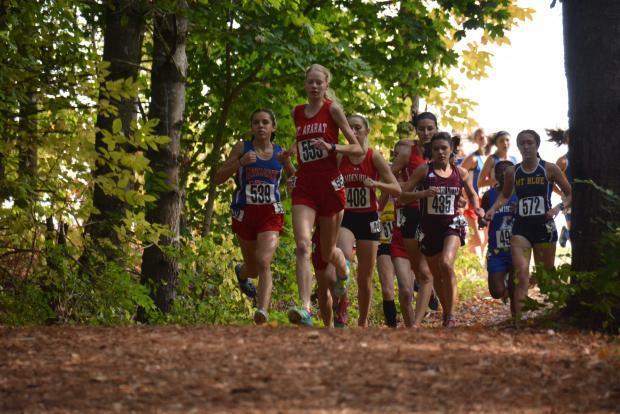 Blue (9th), Lewiston's, Zaid Teklu (10th), Pols, Charlotte Wentworth (12th) of Messalonskee, Hampden's Ava Dowling (13th), and the home team, Cony's, Tessa Jorgensen (14th). The course itself begins on a practice field behind the high school and winds its way through a field surrounding retention ponds before plunging into a wooded conservation area, the Augusta Nature Education Center, maintained by the City of Augusta. Coming down this hill Leckbee still appeared to be in control of the race leading a pack that included Richardson, Iltis, and Stockman. The course then makes one loop around the inner "jayvee loop" and then ascends "the Mountain loop" a long and steep hill with (if Garmin is accurate) a total elevation gain of 106 feet. As the runners reached an early 90 degree turn in the mountain Iltis had established a strong lead with Richardson second and Stockman in third. Leckbee was plainly laboring and was with the chase pack. The paths are well maintained walking paths with a dirt surface supplemented by wood chips in areas susceptible to erosion. After the mountain, the course winds its way through a bucolic retired granite quarry before returning to the inner loop with its series of gullies and abrupt climbs and drops of fifteen feet or more before depositing runners back into the open on the Cony fields. It's a challenging course and most spectators, if they see any of the wooded portion at all, catch pieces of the inner loop and get two views of the runners in the rolling gullies. But a lot can change out on the mountain. By the time the pack returned to the inner loop for the second pass over the final mile Iltis was in command and Stockman had edged ahead of Richardson by a thin margin that Richardson refused to concede until the final 100 meters. 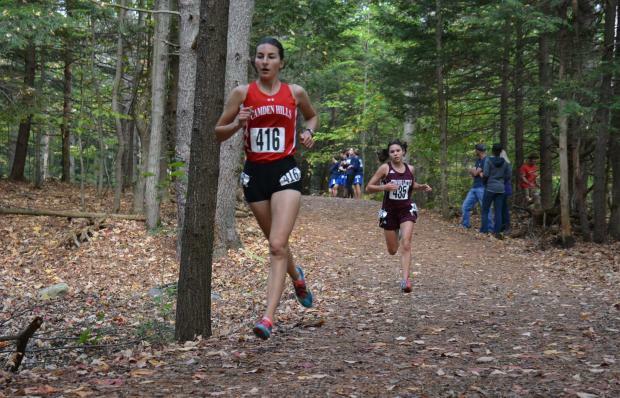 With Courtney Paine of Erskine nursing an injury only Olivia Tiner of Winslow had a shot at denying the Maranacook Black Bears a clean sweep of the top positions in the Class B girls race. 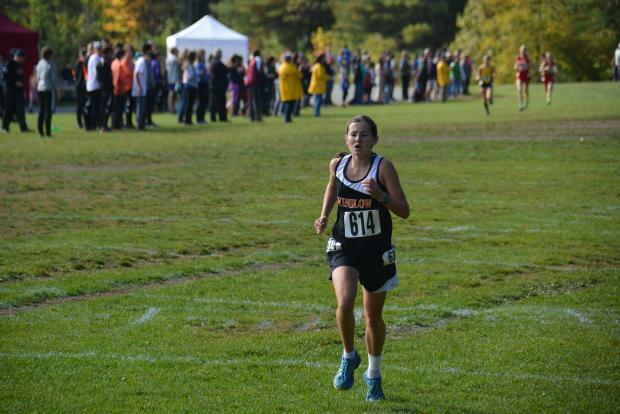 Tiner 's championship run of 20:41 gave her the top spot but she was followed in short order by Maranacooks's Molly McGrail, Laura Parent, and Sophie O'Clair. Morse's Sydney McCarren broke the run of yellow jerseys to take the 5th spot, followed by Emma Allen of Lincoln Academy. Maddie Taylor took the 7th and final spot on the First Team KVAC All Conference team for Maranacook. Madelyn Dwyer in the tenth spot rounded out the scoring for Maranacook as the Black Bears finished with 26 points. Morse was second with 71 and Lincoln Academy took the third spot with 82. Six teams had the 5 runners necessary to compete for the team title. Tiner's race for Winslow was exceptional. 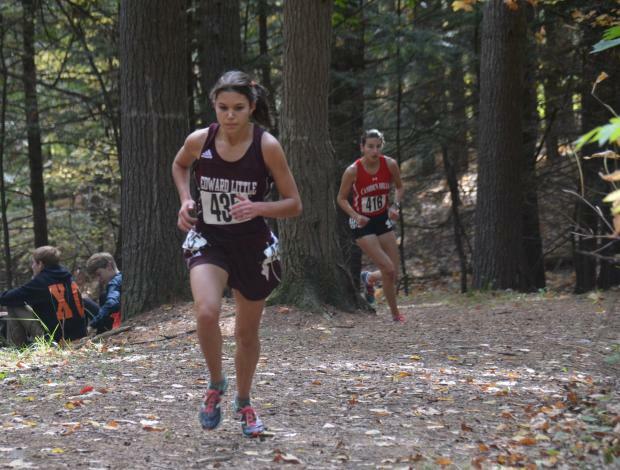 Her closest teammate finished 19th while she ran in a pack that included the three top finishers from Camden and Mt. Ararat along with the veteran Richardson, none of whom she has run with on a regular basis this season. Yet her overall finish was fourth. The second team KVAC All Conference team for Class B included Lillie Mitchell of Belfast (8th), Morse's Jenny Wilbraham (9th), Dwyer (10th) and Dana Reynolds (11th) of Maranacook, Erskine's Mikala McIntyre (12th), Serena Blasius from Medomak Valley and Morse's Micailah Alberston (14th). For Class A, the same thirteen teams head to Belfast next weekend for the Northern Maine Regional meet. There are no other Class A teams north of the KVAC so the race should unfold in similar manner. Granted the course in Belfast is a lot different and times will be better. Even so, only once in the last four seasons have the KVAC winner and runner-up failed to maintain their positions at regionals. In 2015 Mt. 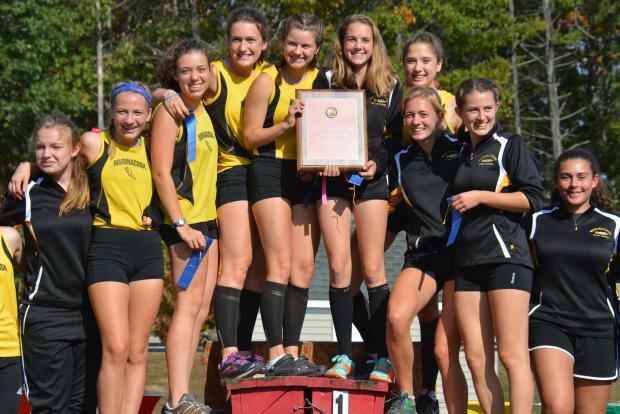 Blue claimed the girls KVAC title for Class A with a one point win over Brunswick, but the following weekend Brunswick took the Northern Maine title by a comfortable margin. In Class B the race will be much different. There are many more Class B (and C) schools north and east of the KVAC. In addition many of the KAVC's smaller schools head south to the Southern Maine Regional at Twin Brook (Cumberland).